Long awaited, the multi million pound restoration of Bramall Hall, Cheshire saw its opening this weekend after nearly two years work. Was it worth the wait ? Walk with me and see. Bramall Hall closed for renovation from 1 Oct 2014 until summer 2016. It received funding from the Heritage Lottery Fund and the restoration has been meticulous to detail and sympathetic to Tudor and Victorian periods. Excellent improvements have been made to some of the rooms, architecture and structure of the building. Bramall Hall is a Tudor manor in Bramhall, Stockport, and Cheshire. It is timber-framed and parts of the building date from the 14th century, with later additions from the 16th and 19th centuries. The house stands in 66 acres of parkland with lakes, woodland, and gardens. Bramall was first described in the Domesday Book in 1086, when it was held by the de Massey family, supporters of William the Conqueror. From the late 14th century it passed to the Davenport family, who built the house, for about 500 years before selling the estate. The Hall and park were sold by a Freeholders Association to the Nevill family. In 1925 it was purchased by John Henry Davies, and then, in 1935, acquired by the local government authority for the area. It is now owned by Stockport Council. Very little has been done to improve the hall but in recent years there was a decision to develop it, restore it to its former glory and make it more of a visitor attraction. It has been a lengthy and meticulous, costly venture and this weekend saw the opening. The park was packed all weekend and I managed to secure tickets to see inside the restored manor house. . The restoration has been a magnificent achievement and I could find no fault in it all. The attention to detail everything from curtain fabrics and wooden furniture is nothing short of superb. The high lights for me were the kitchens and the remarkable preservation of some old wall paintings which were uncovered. These date back to circa 1530. My latest Cheshire day out was yesterday. The events over the weekend were largely linked into medieval activities. There was archery, a Tudor medic, a jester, shield making, a tanner and so much more. These were placed in medieval style tents around the grounds. Marvelously thought out. Photos of the tents, camps and re-enactors appear below. The musicians were playing Tudor music and were dressed in Tudor costumes. The Chapel was already available to visitors before the restoration of the hall but on the wall in the photo above is a very old script and handwriting style which was not seen before. It is thought to be the only place in England with this script on the wall. Below is a very old pew and the carving on the wood must have taken ages. Just think no fancy tools then, just pure craftsmanship. The carved cot above was dated on it 1663. Beautiful. Many of the beds were "tester" beds, i.e. they had a top on them. This was my favourite thing. They have restored so much, leaded windows and also these wall paintings were uncovered. They are stunning and nearly 500 years old. The colours are beautiful. The kitchens were HUGE with old Victorian ovens and lots of old kitchen equipment. My kitchen would fit into this one about 7 times. There was a separate cold food store, butler's pantry and laundry. Seeing the old laundry equipment was so interesting because it is so far removed from what we use now. The other kitchen equipment would be recognisable now e.g. the pestle and mortar, but the laundry equipment with its washboards, possers, dolly tubs and sticks is totally unlike what I would be using at home. Imagine doing the laundry for a house this size with that equipment. These were the bells which summoned the servants from downstairs to the relevant rooms upstairs. These would have been a 18th / 19th C addition. The furniture has been restored and chosen to fit in with each room. I especially liked the globe and there were several chests around the house like that above. The billiard table and scoring board would have been later additions to the house not Tudor. I loved this. Part of the original door has been stripped back so we could see the original withy frame and plaster. Where else would we see this, have a chance to experience this? This is a remarkable restoration and it is faultless in its attention to historical detail. I am not easily pleased when it comes to accuracy and usually find historical faults. But I can find NONE! There are several events planned now and the hall is being used as a centre of the community again. If you are in England or visiting England, it would be worth making a detour to see this place. 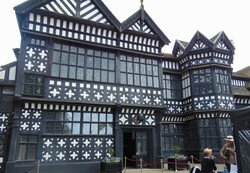 Bramall Hall, Bramhall, Stockport, Cheshire. Do please visit. You won't be disappointed. This is the link for Little Moreton... my favourite Manor. It is fascinating. There are plenty locally to us . … Little Moreton Hall on this site for one example. These Cheshire medieval houses date back centuries- pre Christopher Columbus in fact. Restorations and museums are a favorite of mine. Being on the west coast of the U.S. I have not experienced a manor or hall such as this one. The history would be so absorbing. It is beautifully furnished but not all of what is there belonged to the house and has been acquired by Stockport Council. I have just noted the pew. It is worth noting that pews were uncommon in ordinary churches at that period, as they became more prevalent at the Reformation. But some rich people already had pews in their chapels by then. So this may be a very early example of this kind of ecclesiastical furniture. Yes I think it is Latin. The exciting news for me is this ....... TONIGHT I start an art course and it takes place in this magnificent house Bramall Hall . So excited. watch this space. Imagine .... learning to draw with this as a backdrop! I think that in the first panel I can make out the Latin word Ius, which means law, so I think the inscription to be in Latin. I cannot make out the words, but in 1530 Latin was still being used by scholarly people. It had more status in England than French did, so my guess is that the script is in Latin. I am very hard to satisfy regarding house "restorations " . This one is magnificently undertaken .... and only two miles from my house. I will enquire about he script next time I go but I would think it would Latin or French at this time. Today I went walking in North East Cheshire's beautiful Macclesfield Forest below Tegg's Nose. It's a stunning mix of trees, mountains, reservoirs and nature. Cheshire's world famous radio telescope Jodrell Bank was the location of my Cheshire Day out today. Here's an account of it as a location and a little about its past.